Happy Saturday. So glad you could pop-in. This week, I actually struggled with the challenge @ Our Creative Corner. The super talented Marcy, is our hostess, again this week. Marcy, would like you to use either a silhouette stamp or a cut-out on your paper craft project. I know what you're thinking, 'that sounds pretty easy and exciting!' and well, I think any other week it may have been. But my focus these past few weeks, have been towards creating Halloween gifts, Thanksgiving tags, Christmas packaging and other paper crafts for the upcoming Arts & Crafts Fairs, that I am attending this holiday season. 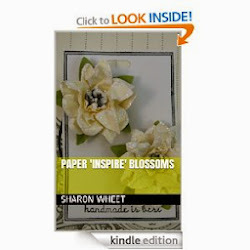 I had a few scraps from a fabulous shabby chic paper pack. I layered the aqua text paper, with the pink polka dot paper. I covered the seam with a scrap piece of crochet trim. To distress the edges of the various papers, I sponged the edges with crumb cake classic ink. Then, I used my sewing machine to run a simple stitch along each side. I wrapped a piece of spun sugar dyed seam binding around the main panel, tied a multi-loop bow and secured the bow to the card front with a Basic Grey brad. I used a Spell-binder die to create the small 'top-note' shaped piece. I stamped the mannequin and heat embossed the shape on the decorative panel piece. I also heat embossed the same stamp shape onto basic black card stock and fussy-cut it out. I used small pieces of foam tape to lift the mannequin piece off the card front. The heart is punched from a discarded coffee cuff. I painted the edges with picket fence distress paint and dunked the heart into a tub of glitter. I tied cream twine through each of the buttons. I created my own little banner piece. I cut a thin piece of card stock, stamped the sentiment, and then curled the banner piece. I tucked the tiny banner behind the corrugated cardboard heart. Thank you for looking. I hope that you get a chance to play along with us @ Our Creative Corner. This card will be available for purchase at my booth during my craft fairs. Sharon I just love your card and using a dressform die-cut as a silhouette is genius! Love this! Great card. Love vintage and this is perfect. Thanks for sharing. This is fabulous, I would never know that you struggled with it, Sharon! Love that mannequin and that shabby designer paper is fabulous. 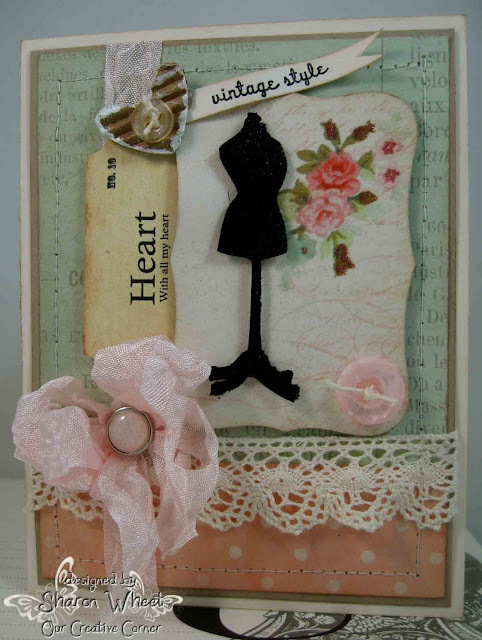 That Melissa Frances flash card and the corrugated heart are both wonderful design additions. Super take on this week's challenge theme. Dadgum girl...you changed gears without a hitch! Clearly you cannot tell that this gave you any grief as it's entirely gorgeous. All your additives are so perfectly placed and the layering is beautiful! I think it's just breath taking! 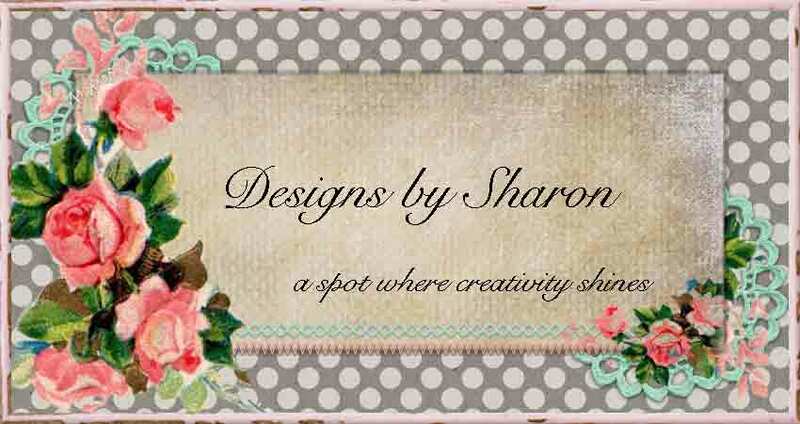 What a gorgeous shabby chic make Sharon! I love all your element...the corrugated paper, the stitching, the flower, the dressform, and all schemed together perfectly! Eye candy here!